Celebrity endorsements have been around for a long time, but it’s usually actors, wrestlers, or athletes who are enduring a photoshoot with a random product. That said, every now and again, it’s a science fiction author who’s promoting something. 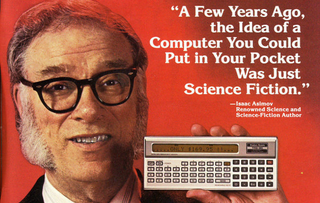 By the 1980s, some science fiction authors had become bona fide household names: Isaac Asimov, Arthur C. Clarke, and others. This made them perfect spokesmen for a bunch of products outside of the usual science fiction fandom circles, but in markets where their names had some meaning to consumers.